I have spent the last fifty years studying the eyes and vision of animals, including man. During that time there have been many discoveries and ideas from vision research that have intrigued me, most of these are known to other scientists, but not more widely. Yet everyone who can see is interested, at some level, with the extraordinary processes involved in imaging the world around us, and in translating those images into perceptions and actions. 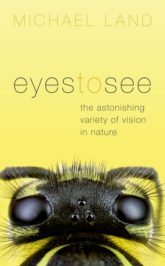 For many, but not all, animals, vision is the most important sense for guiding action, and this is achieved in many different ways by animals at different levels of evolutionary complexity, from molluscs to man. Eyes, as we know them, came into being in the Cambrian era, which began 540 million years ago. Before the Cambrian there were animals, mostly small, and some would have had eyes like those of present-day flatworms: no more than a handful of receptors in a shallow cup. When the Cambrian explosion occurred, caused ultimately by climatic changes, animals got bigger, faster and, crucially, they stared to prey upon each other. To be a predator you need eyes, and the better they resolve the further away you can see prey. Similarly, as a prey animal the better your eyes are the easier it is to spot danger and take evasive action. A visual arms race developed, which resulted in most of the kinds of eyes that are found in modern animals. At the same time the major animal phyla came into existence, or at least became recognisable in the forms of the animals we know today. Most people’s understanding of eyes is that they come in two varieties: camera-type eyes like ours, with a single lens-system focussing light onto a concave retina, and compound eyes with many lenses distributed over a convex surface. Since about 1890 scientific understanding about the number of types of eye, using different optical systems to produce images, has risen slowly, and now stands at between eight and ten, depending who you ask. Many of the systems have parallels in optical technology, but not all. For example, the mirror system of lobster eyes was unknown before its discovery in 1975, but it has now been adopted for use in X-ray optical systems. The laws of physics are the same for biology and technology, but the materials employed to produce structures that refract and reflect are very different. Identifying others is a feat that we are very good at, but it does involve a great deal of brain-power; attempts to achieve identification using the computational power of artificial intelligence have had only limited success. Some of the ways that animals with small brains manage to identify others are extraordinary. Jumping spiders use unique scanning eye movements to establish whether the object they have just detected has a pattern of legs that signify it is another jumping spider (to be mated or avoided) rather than an insect (to be eaten). Fiddler crabs use the timing pattern of their claw waving, rather than physical appearance, to demonstrate which species they are facing. Mantis shrimps again use scanning eye movements coupled with an elaborate colour and polarisation vision system to determine whether another mantis shrimp has the appropriate distinguishing ‘badges’ on its body. All these animals avoid the “difficult” problem of pattern recognition by using specific features that code species identity. If you watch the movements of other people’s eyes, you will find that they fall into two categories: very quick movements (saccades) that shift the direction of view, and slower movements that compensate for movements of the head or the surroundings, and so keep the image on the retina stationary (fixations). Steady gaze is essential to avoid motion blur (the eye is like a camera with a slow shutter speed), and it turns out that this ‘saccade and fixate’ eye movement strategy is common to almost all animals with good eyesight, from cuttlefish and insects to humans. One of the strange features of our eye movements is that we are scarcely aware of them. Every time we make a saccade the images shifts dramatically across our retinas, and yet we don’t see this; rather, we see a stable world which our gaze roams freely across, but without the abrupt disconnections that occur to the images themselves. This raises many interesting questions about the way our brains “edit” the information from the eyes before it reaches conscious perception. Although it has been known for many years that different regions of the brain deal with different aspects of the image, such as form, distance, motion and colour, there is no single brain area that holds an image of the world as we think we see it. This and other enigmatic features of vision continue to puzzle both philosophers and scientists. Featured image credit: Hummel Bombus Eye by image4you. CC0 via Pixabay.